Advanced Affordable Hearing offers you the very best value for digital hearing aids. By offering hearing aids direct to you and avoiding excessive additional costs, we are able to dramatically discount our prices over our competitors. 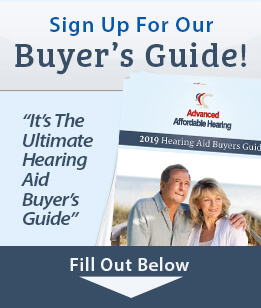 Advanced Affordable Hearing was formed 23 years ago with the intent of providing a high quality, affordable hearing aid solution for the growing number of people with hearing loss. Our desire is to help you by providing an alternative to paying thousands of dollars for hearing aids. Now you can get quality digital hearing aids for a fraction of the cost. Each model we sell is carefully selected to give you better hearing at a great value. We understand that hearing loss is treatable and the digital hearing aids we offer are reliable, inexpensive and will improve your quality of life. You deserve more than having to spend thousands of dollars just so you can hear clearly. Our customer is YOU - the budget-conscious hearing aid buyer in need of a value-based quality solution to help you hear more clearly. Our affordable line of HearClearTM digital hearing aids have a Risk Free - 30 Day Money Back Guarantee and are equipped with advanced features and technology comparable to hearing aids which cost thousands of dollars - for a fraction of the price. We have helped thousands of satisfied customers address their hearing loss and move forward on their journey to better hearing - while saving up to 90% compared to other brands. With low prices and outstanding customer service, we invite you to experience the difference Advanced Affordable Hearing's HearClearTM hearing aids can make in your life! Low prices and quality products are certainly important considerations when making a purchase decision, however there are others as well. Here are a few more ways that Advanced Affordable Hearing stands out from the competition. Read our testimonials to see the glowing reminder that we are making a difference in many lives. We have helped thousands of people in all corners of the globe – from the US to Australia to Canada to New Zealand to England and many more in between. Is the Hearing Aid you received not what you expected? Did it not fit or help you hear better? Whatever the reason, you won't be stuck with a hearing aid you cannot use or that you do not want. We are proud to offer one of the best return policies in the industry. Each HearClearTM hearing aid we sell is backed by a rock solid six month or one year manufacturers warranty. If they become defective or stop working, we will fix them or replace them at no cost. Our customer service team has a passion for helping you make the right choice to treat your hearing loss. Whether you have already made a purchase or you are thinking about buying, our friendly sales and service staff is only a phone call or email away. In addition to our line of HearClearTM digital hearing aids, we also offer hearing aid accessories such as tubes, domes, batteries and more for many other manufacturers hearing aids as well, including – Phonak, Unitron, ReSound, Rexton, MD Hearing, Hansaton and more. Advanced Affordable Hearing has made a commitment to uphold the Standards of BBB Accreditation which include creating and maintaining customer trust, advertising honestly, being transparent, honoring the promises we make, safeguarding privacy and conducting our business with integrity. Our A+ BBB rating gives you the confidence that you will be treated with courtesy and respect.